Tough enough to withstand countless slams on the bar and meticulously engineered to pour symmetrical latte art every single time. Surprisingly, perfect spout and handle alignment is not a high-priority of milk jug manufacturers. Motivated to find just one precise pitcher that met Matt’s standard for competitions, The Pitcher was born. Our pitcher is meticulously aligned in all directions down to the millimeter. At the same time, we beefed up durability to withstand constant use behind bar. As for colors, we've got two. The first, we call Space Black. The environmentally-friendly electrocoat is impossibly shiny and deep. No peeling, no chips. The color is dissolved into the metal itself. The second, Polished Steel, has a high-sheen glossy silver finish. Both are available in 400ml and 600ml sizes. The handle and spout is perfectly aligned in all directions to +/- 2 millimeters. Perfect alignment means this pitcher pours consistent and symmetrical latte art every time. Designed for high accuracy latte art and zero dribbles, our spout is wide enough for slow-settas and narrow enough for detailed pouring. This is a professional grade tool that’s built tough for use after use behind bar. Thick 0.9mm stainless bends less and holds shape longer, while the fully flush laser welded handle has no un-washable crevices around the join and is guaranteed to stay on for at least 10 years. 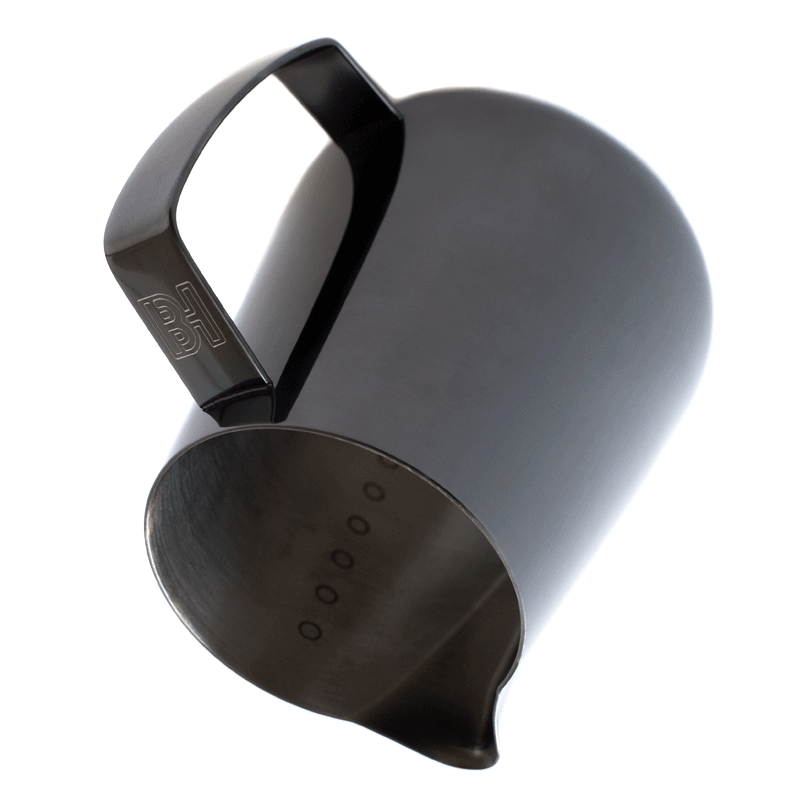 Markers on the inside of the pitcher allow baristas to quickly fill the pitcher with an accurate amount of milk. 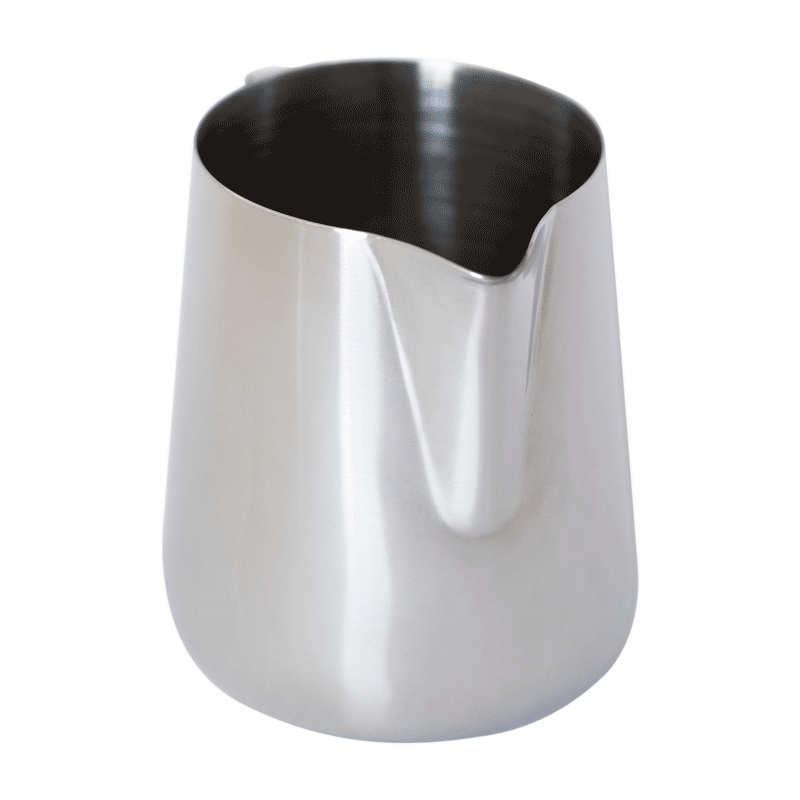 Placed on either side of the spout, they provide an ambidextrous indication that helps to reduce waste. Sometimes pitchers, especially the Space Black color, have small marks on them. Don’t worry! These will disappear. Simply hand wash with warm water and dish soap before taking your new pitcher for a spin on bar. 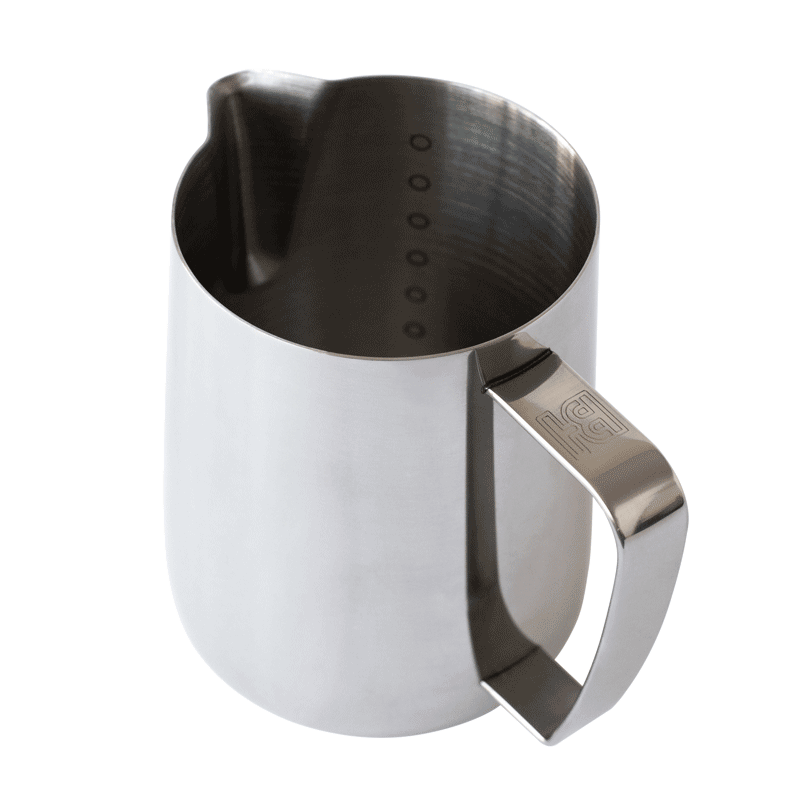 The maximum deviation of the tip of the spout from the axis of the handle is guaranteed to be less than 2mm. This doesn’t mean the spout is going to be 2mm off. 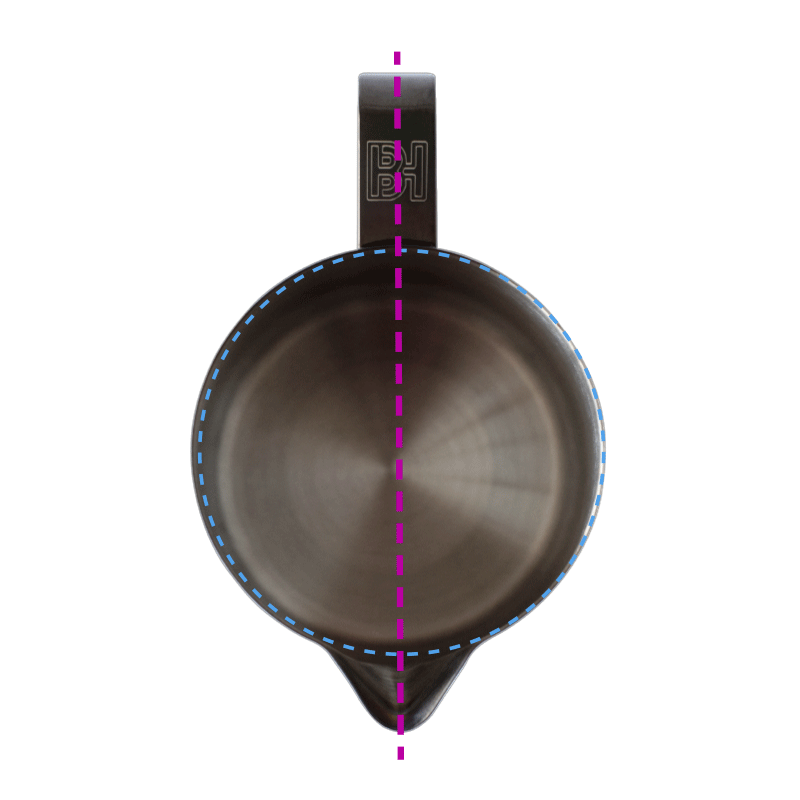 It might mean the handle is 1mm to the left and the spout is 1mm to the right (or some combination thereof) when compared to the body of the pitcher. We believe this tolerance to be the best, and possibly only in the world, and we’re constantly trying to improve it.